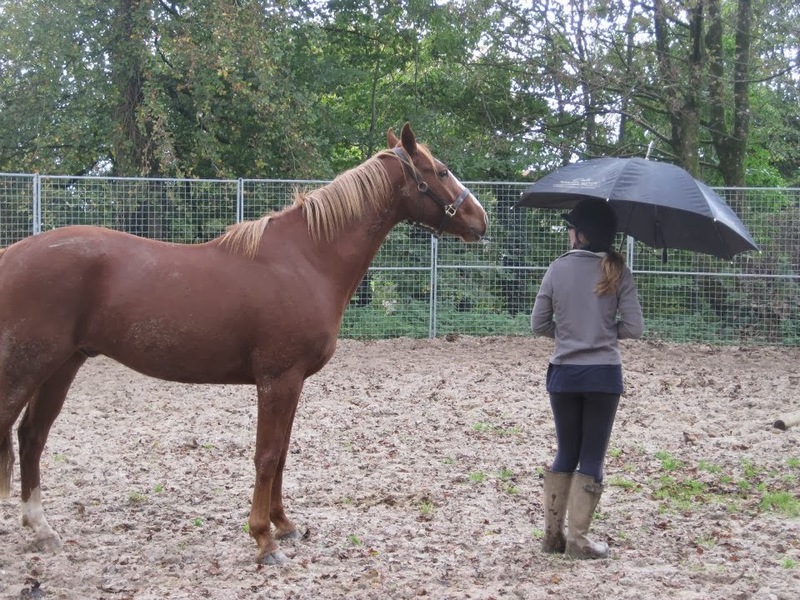 Jenny is a Recommended Associate of Intelligent Horsemanship and holder of The Monty Roberts Preliminary Certificate of Horsemanship. Jenny works using effective and logical training techniques derived from the study of equine psychology and behaviour, to develop the relationship and understanding between horse and owner. She covers the whole of the South West. 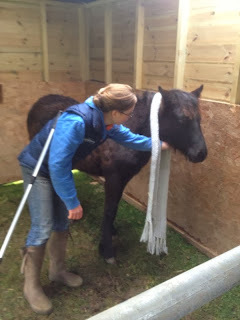 To contact Jenny visit www.jennymajorhorsemanship.com or telephone 01984 623143. No... it's not a bad case of the cobwebs, and no, I haven't gone mad... well, not any madder anyway! 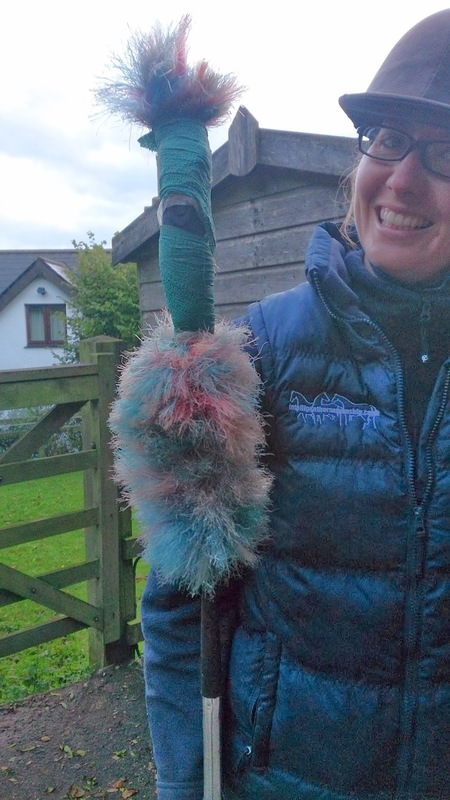 First touch with a duster allows me to extend the length of my arm, and provide a nice soft, friendly sensation. Using advance and retreat we work to teach pony to stand still, and gradually we can move onto hands... look at the release of tension when we do get hands on! Chief Of The Clan (AKA Big Ears) retired as a National Hunt horse before going off to a hunting home. 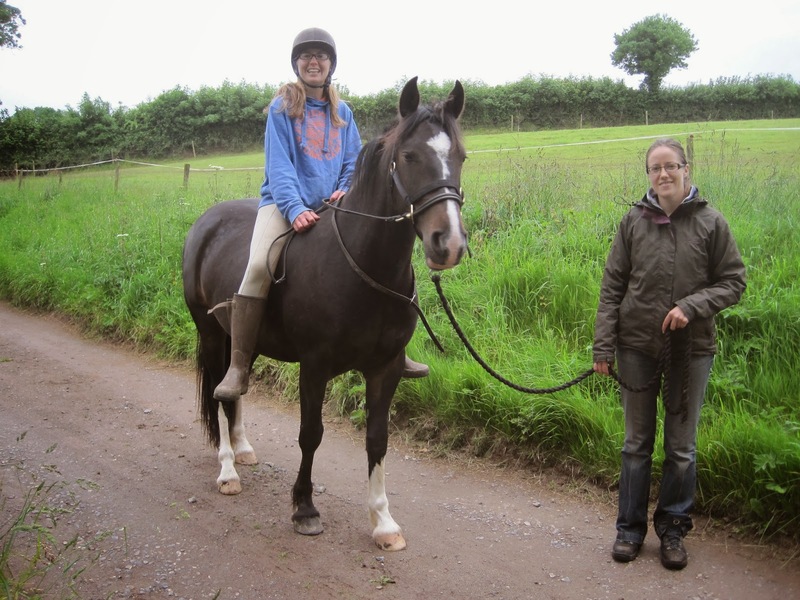 He's a very sensitive chap and it quickly became apparent that he wasn't suitable for his new rider as he began rearing under saddle, which quickly escalated to him becoming a pretty dangerous horse to be around on the ground in general. Luckily for him, my friend Warwick decided to take him on as a project and he is now being re schooled as a classically ridden horse. At over 17hh he finds the trailer a bit of a squeeze and tends to be quite panicky about it. Even approaching the trailer sends his adrenaline rocketing and he begins to rear and call out. 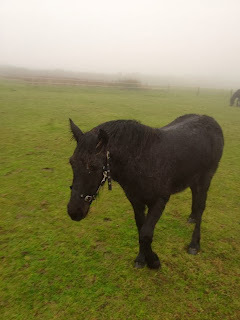 He is reluctant to go in and once in will not stand still, charging out at the first opportunity, knocking past anyone and anything in his way. Session one begins in the field asking him to walk slowly and calmly over rubber matting, and then building up to being able to stand still, back up and navigate the corner. The picture is taken towards the end of the session- a considerable amount of work had gone into this!! Session two investigates how he feels about small spaces. We began with a large gap and slowly decreased the size, at each stage ensuring he was happy to walk forwards, backwards and stand still at any given point. The aim being to gain control of every foot movement. We also used head lowering to encourage him to keep his adrenaline levels down. Sitting on Jack pony for the first time. 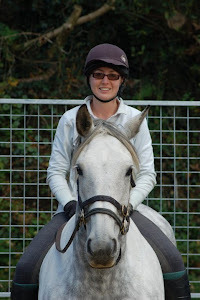 This is one from the archives... Larry was a 4 year old prospective competition horse, just beginning his education. Before I even think about the saddle I like to ensure that a youngster has experienced as many different novel objects as possible.This helps to build confidence, develop the trust and relationship with humans, and generally desensitise to the big wide world. It's that time of year again...... CLIPPING! 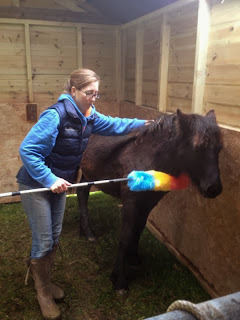 I was asked by one of my lovely regular clients to help train one of her clipper phobic ponies. 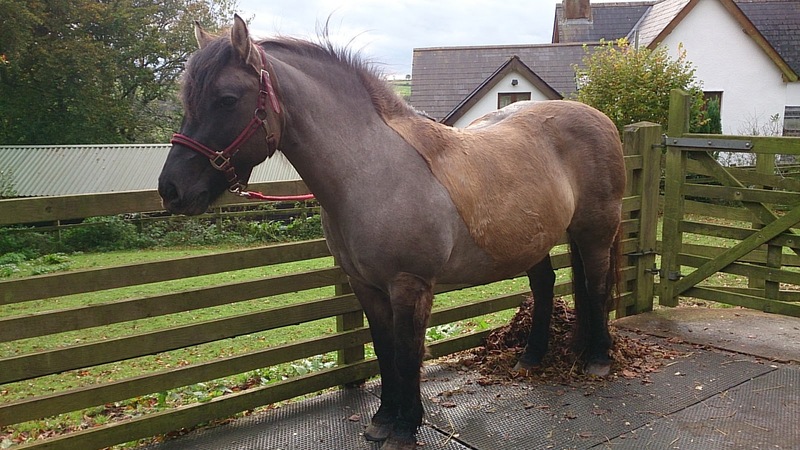 Tam is a Highland Pony and has been clipped in the past by previous owners. However, her present reaction when presented with the clippers is to quickly vacate to the furthest possible location and shake with worry. Her owner wasn't sure that we would ever be able to completely desensitise Tam to the clippers... however, fully confident in IH methods I knew we could rise to the challenge. We began by doing some advance and retreat work with a feather duster, ensuring that she was happy with being touched all over her body. 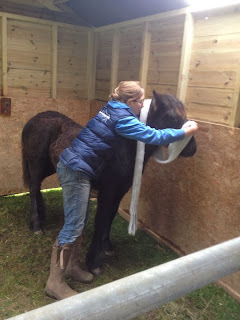 Over four sessions we slowly and incrementally repeated the work beginning with an old electric toothbrush progressing to a quiet dog trimmer and then noisier clippers before finishing with the ordinary horse clippers. We took our time and spent as long as we needed to at each stage before moving onto the next. Working logically and progressively meant that we built firm foundations that we could revisit if necessary. We finished session four with a very relaxed pony who stood perfectly still with low adrenaline and no anxiety, worry or hassle. This cheeky little chappy is one of the most inquisitive and bold characters I have had the pleasure of working with. Having worked with several of his companions and witnessed his interest and downright nosiness we thought it was time to let him into 'school'. He was completely unphased by all the equipment and we hope to be longlining him soon!